This incredible reserve is among the best inland birding and wildlife viewing spots in Central Florida boasting a bird checklist of over 220 species. This former cattle ranch plays a key role in the conservation efforts of the Upper Peace River/Lake Hancock watershed. Freshwater marsh, hardwood swamp, oak hammocks, ponds and lake habitats teem with impressive numbers of wintering ducks and shorebirds; both species of whistling duck can be found as well as Long-billed Dowitcher and American Avocet. Glossy Ibis, King Rail, Wood Storks, Limpkins, Purple Gallinules, Bald Eagles and Florida Sandhill Cranes are present year-round. 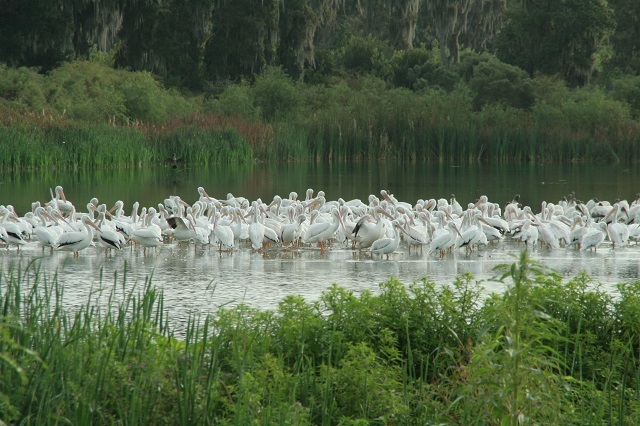 Large numbers of American White Pelicans winter. Search the oak woodlands for resident and migrant songbirds. Pastures have Eastern Meadowlarks and wintering sparrows. Rare sightings include Cinnamon Teal, Ross’s Goose, American Golden Plover, Ash-throated Flycatcher, Western Kingbird, Nashville Warbler, and Dickcissel. 45 butterfly species have been recorded including Spicebush Swallowtail, Dainty Sulphur, Gray Ministreak, Horace’s Duskywing and Clouded Skipper. Trails by the nature center are paved and are wheelchair-friendly. Free tram tours and nature workshops are offered throughout the year.